You can read Part I for techniques such as STED, PALM, STORM, etc. So SI enhances spatial resolution by collecting information from frequency space outside the observable region. The figure below shows this process in reciprocal space: (a) the Fourier transform (FT) of a normal image and (b) of an SI image, with arrows pointing to the additional information from different areas of reciprocal space superimposed; with several images like in b, it is possible to computationally (c) separate and (d) reconstruct the FT image, which has much more resolution information. The reverse FT returns d to a super-resolution image. But this only enhances the resolution by a factor of 2 (because the SI pattern cannot be focused to anything smaller than half the wavelength of the excitation light). To further increase the resolution, you can introduce nonlinearities, which show up as higher-order harmonics in the FT. In reference 1, Gustafsson uses saturation of the fluorescent sample as the nonlinear effect. A sinusoidal saturating excitation beam produces the distorted fluorescence intensity pattern in the top curve of (a) in the figure below. The nonpolynomial nonlinearity yields a series of higher-order harmonics in the FT, as seen in the top curve of (b) below. Each higher-order harmonic in the FT allows another set of images that can be used to reconstruct a larger area in reciprocal space, and thus a higher resolution. In this case, Gustafsson achieves less than 50-nm resolving power (solid line), more than five times that of the microscope in its normal configuration (dashed line). The figure below demonstrates the high resolution, going from (a) the normal microscope image, to (b and c) increasing order of harmonics used in the reconstruction, to (d and e) a high-res image from nine frames of 50-nm fluorescent beads. The main problems with SI are that, in this incarnation, saturating excitation powers cause more photodamage and lower fluorophore photostability, and sample drift must be kept to below the resolving distance. The former limitation might be solved by using a different nonlinearity (such as stimulated emission depletion or reversable photoactivation, both of which are used in other sub-diffraction imaging schemes); the latter limits live-cell imaging and may require faster frame rates or the use of some fiducial markers for drift subtraction. Nevertheless, SI is certainly a strong contender for further application in the field of super-resolution microscopy. Gustafsson, M. G. L. Nonlinear structured-illumination microscopy: Wide-field fluorescence imaging with theoretically unlimited resolution. PNAS 2005, 102(37), 13081–13086. Gustafsson, M. G. L. Surpassing the lateral resolution limit by a factor of two using structured illumination microscopy. J. of Microsc. 2000, 198(2), 82–87. 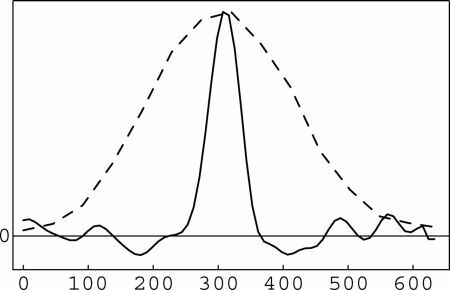 Bailey, B.; Farkas, D. L.; Taylor, D. L.; Lanni, F. Enhancement of axial resolution in fluorescence microscopy by standing-wave excitation. Nature 1993, 366, 44–48. I will be surprised if I see a dynamical application of any of these techniques, but I am amazed with both PALM and STED. especially PALM looks pretty promising as a replacement for cryo-EM. it will be great if they can engineer different photoactivatable fluorescent proteins. Yeah, getting any of these methods to go fast enough to do live-cell imaging is sorta a pipe dream right now. But advances in imaging sensitivity and fluorophore brightness/photostability/photoactivation will someday make anything possible. Maybe. I guess we need couple more people like Tsien, Betzig, and Hell(I like the name). And Lord. We need more people like Sam Lord. (I like the name). BTW, why do you have such a name? i dunno. guess i was born with it. that, and i’m the nephew of god. jesus’ cousin.